We recently stumbled across this website while doing some work with our friends over at Biker City Guide. 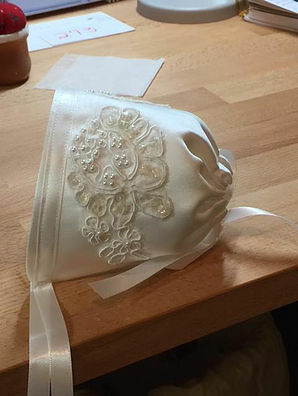 We were of course saddened at first, but soon realized what an amazing thing this group is doing, offering comfort at a parents most devastating experience, the comfort of a beautiful burial outfit to lay their sweet angel to rest. 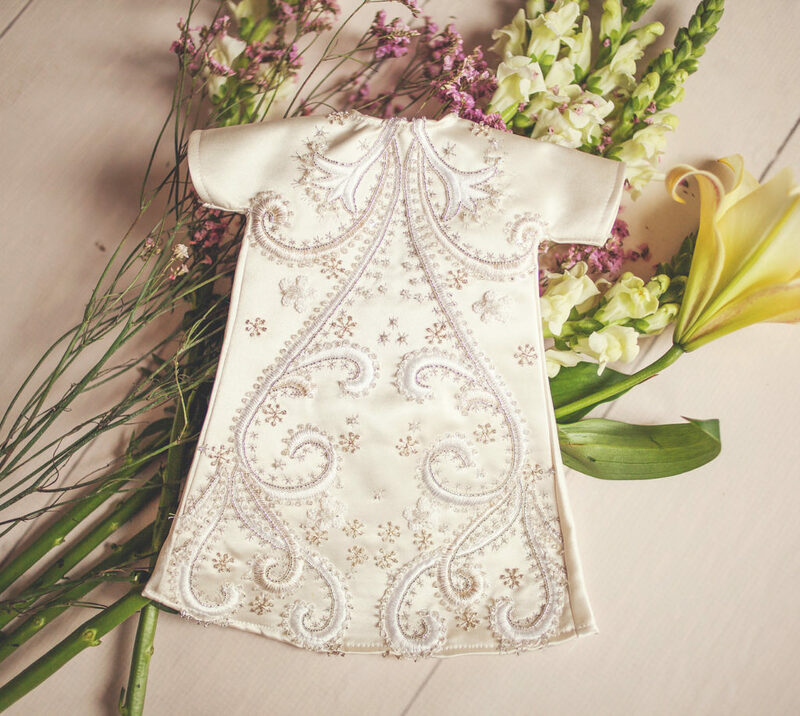 Little Angel Gowns is a charitable organization that transforms donated wedding gowns into beautiful infant burial attire. Almost everyone knows someone who has suffered the loss of a baby or perhaps even endured this pain themselves. This is the part that we like best; these beautiful little garments are provided as a gift to the grieving family. There is never a charge! Little Angel Gowns are suitable for infants from one pound to approximately 13 pounds. For infants, too small for a gown, they offer a specially designed pocket that best accommodates their size. they have available gowns for girls, unisex, and small boys; a modified tuxedo design is available for boys three pounds to 13 pounds. Also available are matching or compatible outfits for multiple births. Each gift is individually packaged and includes a matching cap and keepsake heart memento for the parents. Yea, we know this is heart breaking, but simply amazing at the same time. To date they have provided over 6,000 angel gowns to over 200 hospitals and funeral centers in 34 states. They can also provide burial gowns to individuals who contact them direct and offer overnight shipping. 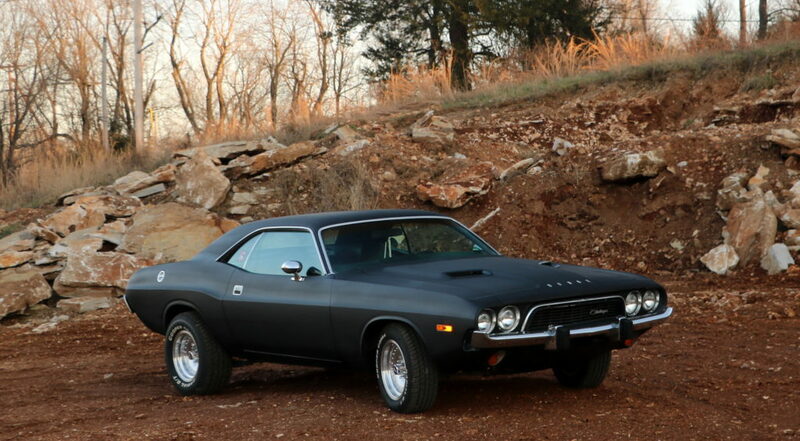 Since my last update, a lot of amazing changes have happened in my life; I sold my 1981 Ironhead “Iron Man” after owning it eight years to finish building my 1939 Knucklehead; I sold my 1974 Dodge Charger to purchase a 1968 Charger; I opted to paint my 1973 Rallye Challenger flat black instead of purple and I even covered up my Chevy bowtie tattoo with Mopar art! None of these changes were easy but I felt that they had to be made to keep moving forward. After writing for Renegade Magazine for over four years, I am now the editor. I also started working with Throttle Gals Magazine in 2016. My “Throwback Thursdays” event at the local Kenda Drive-In gained national attention in several magazines plus an article published via Street Muscle Magazine- http://www.streetmusclemag.com/features/cruise-night-and-a-drive-in-movie-not-really-a-thing-of-the-past/. I finished my Knucklehead half-sleeve on my left arm and I hosted the first ever Distinguished Gentleman’s Ride (DGR) in my hometown. I even received an award for raising the most money on my ride for their cause. Last year after coming back from my trip to The Smoke Out in North Carolina, I was asked to become the official Ambassador for motorcycle tourism for the entire state of Arkansas where I am featured in their promotional video as well as having two pages in the 2018 Arkansas Motorcycling guide! 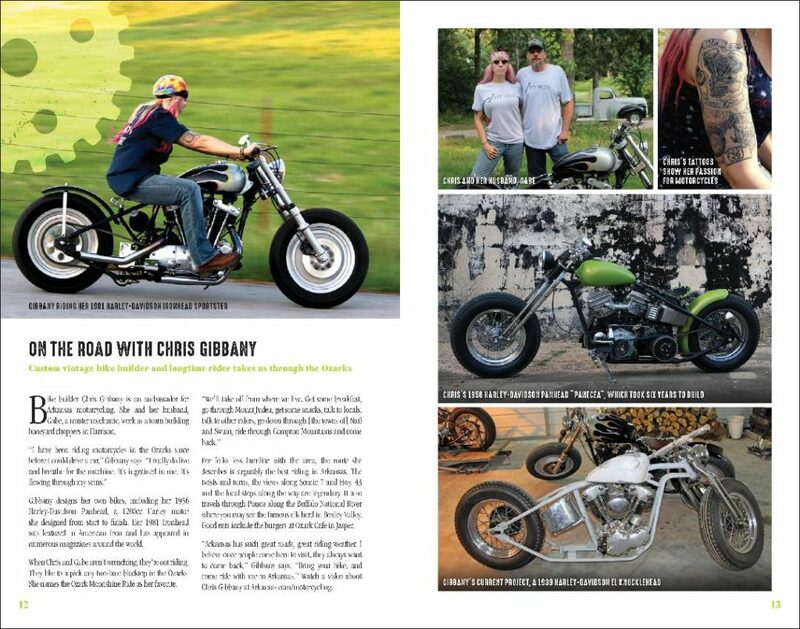 I was also pleasantly surprised to find that my 1956 Panhead received a four-page feature in The Horse Backstreet Choppers and this month got six pages plus the cover of American Iron Garage Magazine! My narcissistic mother died in 2015 and after fighting my brother (who is also a narcissist) for over two years, the estate was finally settled. I used my portion, the part that didn’t go to attorney fees, to purchase a 1937 Knucklehead that I have dubbed “Redemption”. From the moment I brought the bike home, GOD put the name in my head as my redemption is to set others free. I have already gotten some big-name sponsors for this project. Avon Tyres has come on board with a set of MK II’s since I run 16’s on both the front and rear of all of my builds (this will be my fourth); Baker Drivetrain has provided me with the coveted N-1 that puts neutral on the bottom which I install in all of my four-speed transmissions; Spectro Oils is supplying oils and other lubricants, and Motorcycle House is donating $150 worth of motorcycle gear for when I get the project up and running. Even though I am very active in the car and motorcycle communities, it is all unpaid work. For the last 12 years, I have dedicated my life to volunteering to causes that I am passionate about. 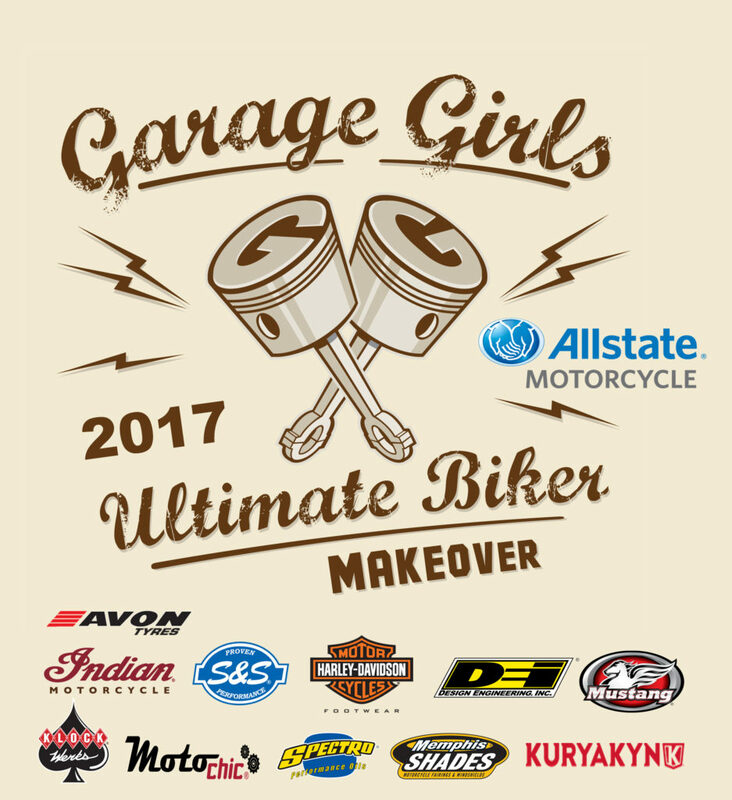 I will forever be grateful to Sara and Garage-Girls for selecting me as the winner of the 2014 Garage-Girls Ultimate Biker Makeover. Winning this contest changed my life and has provided so many amazing opportunities. I love to promote women and the hobby in general and am thankful for the continued support from the sponsors of the Garage-Girls Makeover. My articles appear in many publications and websites to empower people to live their best life. I am super passionate about spreading my love of vintage cars and motorcycles to everyone, young and old, male or female. I want to let people know that if you have your priorities straight, that you can accomplish almost anything regardless of what you have been told! I live my life to the fullest, not just for myself, but also for others by constantly promoting people and products that I believe in. Living well truly is the best revenge! I am accepting donations to not only complete this project but to purchase brochures, bracelets, motivational cards, and T-shirts that I would like to get into the hands of others who have been victims as well as the general public to raise awareness to narcissistic abuse. Telling my story is not easy, but I feel it has to be shared to keep moving forward. If my wounds were visible, you would not recognize me. There is always hope. There is always REDEMPTION. Everyone remembers how they first met someone that is special, someone you share a connection with, someone you enjoy spending time with. For some reason I can not for the life of me remember how me and Goth met. It’s like we have just been friends forever, I honestly don’t remember who introduced us, or where we were. What I can remember, perfectly in my mind, down to some really small details are some of the best times we shared together, and there were plenty. Of course most of those times revolved around Morgan “Samantha” Storm and the the American Motor Drome Wall of Death. Samantha was the best female wall trick rider and if you were lucky enough to ever catch her ride the wall, you would have seen just how special she was, and always will be. Samantha passed away in 2008 and left a major hole in our hearts. For a few years at most of the major bike rallies, us three Amigo’s would be raising hell having the time of our lives. I’m sure when you hear “raising hell” at a motorcycle rally you picture drinking whiskey and beer, risky behavior and such. Nah, that wasn’t our crew. We were too busy goofing off making runs to the dollar store to find weird things to prank people with, and don’t forget the skim milk, that was Sammy’s preferred drink. For those of you that didn’t know Goth Girl she was a legend through and through. She lived life on HER terms, she played hard, learned lessons and applied those lessons in her every day life. I have yet, to this day found another human as loyal and solid as this woman. Her word was gold, and a hand shake was all you needed to know just how trust worthy she was. My friend wasn’t like anyone else.. period. She was a Graduate of Berklee College of Music, and an understudy to old-school jazz greats, Ray Santisi and Bill Evans. She rode a motorcycle, she stood up for the weak, she fought for what was right, and she did this all with the goal of making someone smile and or laugh. Goth was a warrior in so many ways, she let her heart lead her in everything she did. This was a woman that would never sell out, it had to be a legit operation, with a goal she was passionate about, or she just wasn’t on board. She was a recording artist, she was an esteemed piano player and was the house pianist for many years at Rincon Center and One Market Plaza in San Fransico. Goth was also the co-founder of the infamous Devil Dolls M/C, affiliated with Hell’s Angels, with chapters in the United States and Sweden. Goth held a full patch. 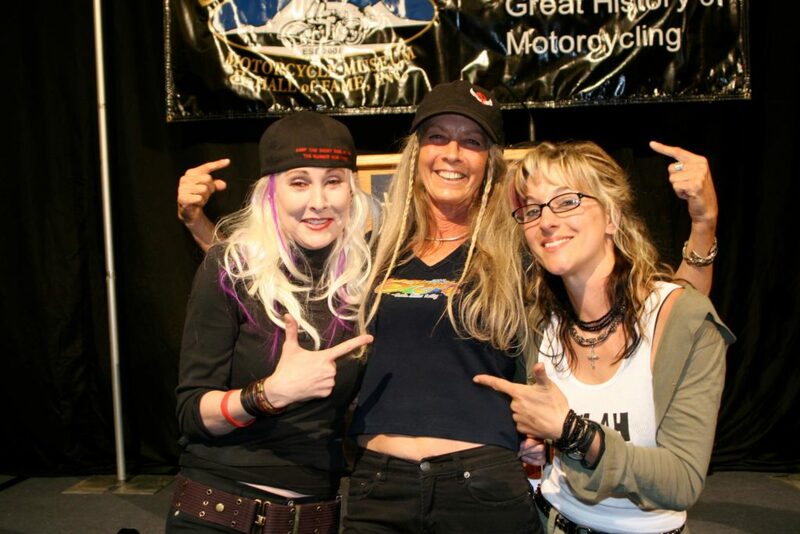 She was also a co-star in the widely seen Discovery Channel show “Motorcycle Women”, along with a great group of ladies I’m fortunate to share friendships with. That show alone was responsible for influencing many young riders you see all over instagram today. She was an entrepreneur and developed “Goth Block” a sunscreen with “SPF 666”, she later sold that to a major corporation. I could never go anywhere without my “Goth Block”. The girl was hip to the damage the sun can do to your skin, and her pasty white skin was flawless, her beauty was ageless, her style was classic and glamorous and her heart was genuine. 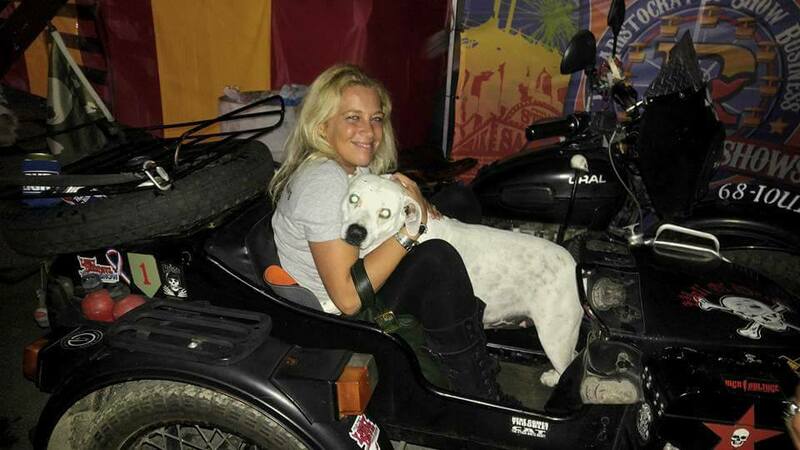 She loved animals and along with myself and Samantha we were determined to help animals however we could. She loved nature and took a stand when the city was trying to cut down a tree outside her apartment building. There was no stopping this girl. We used to tell each other stories of how if we were super heroes we would swoop in and help out the innocent, the children, the animals, we would fight to right a wrong, we would make a difference in someone’s life, human or animal. When I learned of her passing, after the hurt I was comforted with the thought of her joining Samantha up in heaven to fulfill our goal of looking after the animals, they are both now those superheroes we all envisioned ourselves as. Ride in Peace my dear friend, thank you for sharing your beauty with us all, I’ll see you and Samantha soon, but not too soon. I still have our work here on earth to tend to, you guys got the bigger shift upstairs. 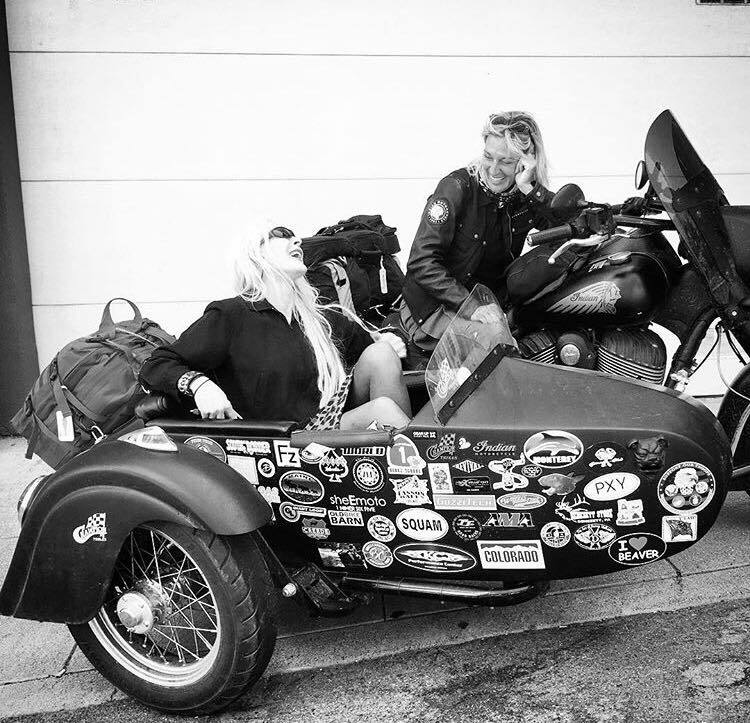 It’s that time of year, the time we like to reflect on all the wonderful outings we were able to enjoy through the year and the people we have met thanks to motorcycles and all thing we find near and dear to our heart in our garages. Of course always high on our list is the opportunity to help out a fellow rider in need with our Ultimate Biker Makeover Contest. Without the help and support of our amazing sponsors we couldn’t spread the magic we have been so fortunate to do for the last 9 years. 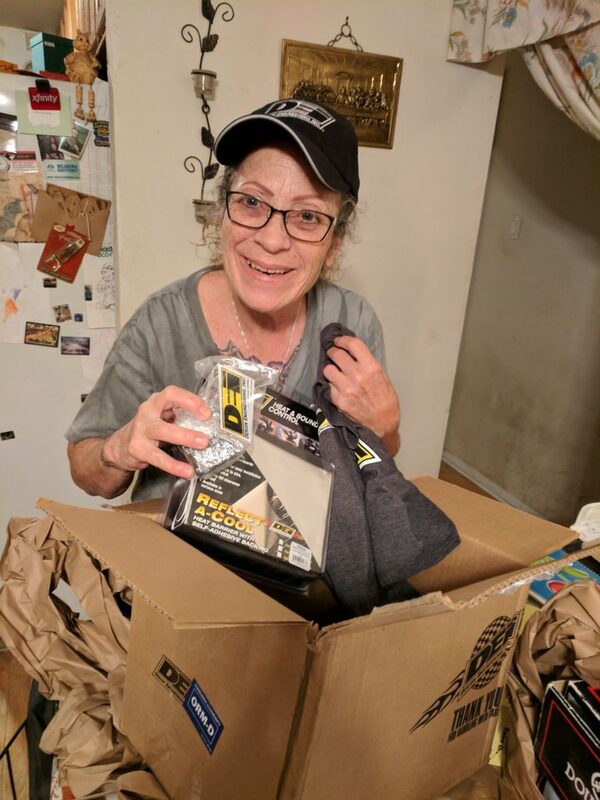 We reached out to this years winner, Patricia “Ditch” Thurston and took some time to get caught up on what she has been doing with all her winnings. GG; Can you tell us how how you felt when you got the news that you were selected the 2017 winner? PT; The feelings that overcame me when I checked who had won the Garage-Girl’s Ultimate Biker Makeover, were a flood of emotions as I stated before, “…cried like a sissy” lol. Seriously, I was busy for a few days with motorcycle family in town for a biker wedding, and didn’t have time to check for a few days after returning from Sturgis. So after entering four of the five last few years, I was literally overwhelmed to see myself, I actually closed the page and relaunched it to be sure, and the slobbering tears began, like WOW! GG; Where there any parts in the winnings that you were really in dire need of? PT; I’m ever so grateful to Avon Tyres and Spectro Oil for bringing the two things to keep us safe on the road, tires for me to ride and plenty of fresh oil, for the engine to run right. My only reason for entering the contest, I was in my garage, just finished some maintenance and looked longing at my Dyna, with a heavy layer of dust and so wished I could take the Dyna to Sturgis, enter the Buffalo Chip’s show and in a burn-out contest to earn the rear tire I couldn’t afford! And then there was oil, I scrounged through the closet and found enough for a change, but not good enough after sitting, it would need another change after a few hundred miles to get the “yuks” out from sitting. I realized I couldn’t afford to get the Dyna safely on the road and it dawned on me, I had an avenue and it may not make Sturgis, but I could possibly be riding my favorite bike soon if I entered the Garage-Girls contest! GG; Would you encourage others to enter this contest? PT; As for encouraging others to enter an essay in the Garage-Girl’s contest, I’d have to say yes! I’m wearing the awesome shirt S&S Cycles sent, Grant was great in sending out a huge box of gear right away and of course, already being a fan, I couldn’t wait to wear a shirt out riding, and whoa!!! the compliments! I’d no idea and happen to be at a party with a group of bikers’ very aware of S&S Cycles in our motorcycle world. I was still so humbled by the attention when they learned of the contest, a few folks were taking phones out to view on FB and Instagram and I believe several follow Garage-Girl’s now. 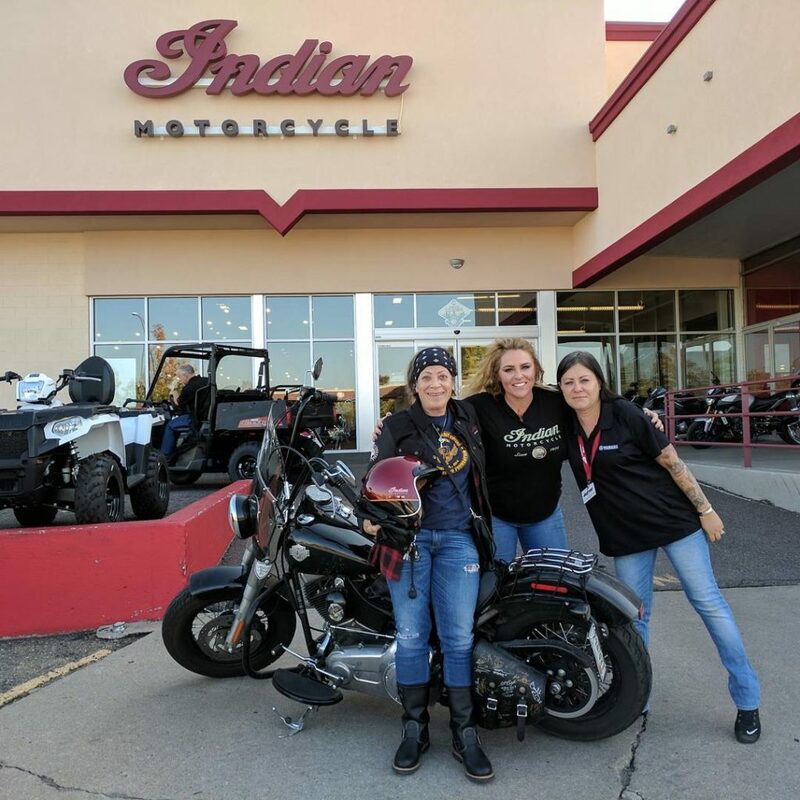 I’m pretty certain at least two ladies at Indian MC of Denver follow, Colleen was awesome helping me with sizes to order the gear from Indian MC, my full helmet, leather/denim jacket, gloves and those (redwing) boots. 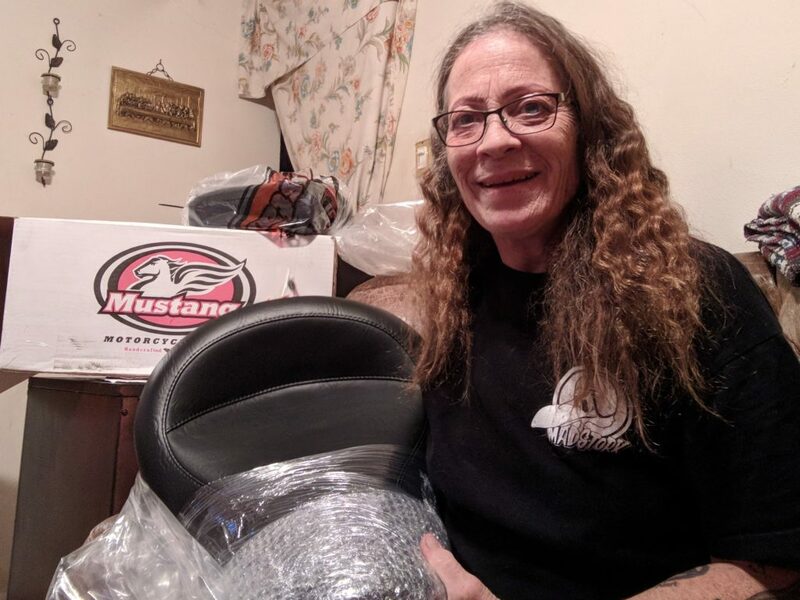 Even my riding bff’s, Debby and Michelle will tell folks, about my winnings, they both loved my Mustang seat; so I think the Garage-Girl word is definitely spreading. GG; Has winning this contest inspired you in a certain way? PT; Winning the Ultimate Biker Makeover has strengthened my desire to get my Dyna prepared for the Hoka Hey 2018 ride. I need to have a bike better set-up for the distance/miles that are endured during those few weeks of riding and had been acquiring parts for a few years, drawing pictures in my mind and a few on paper. 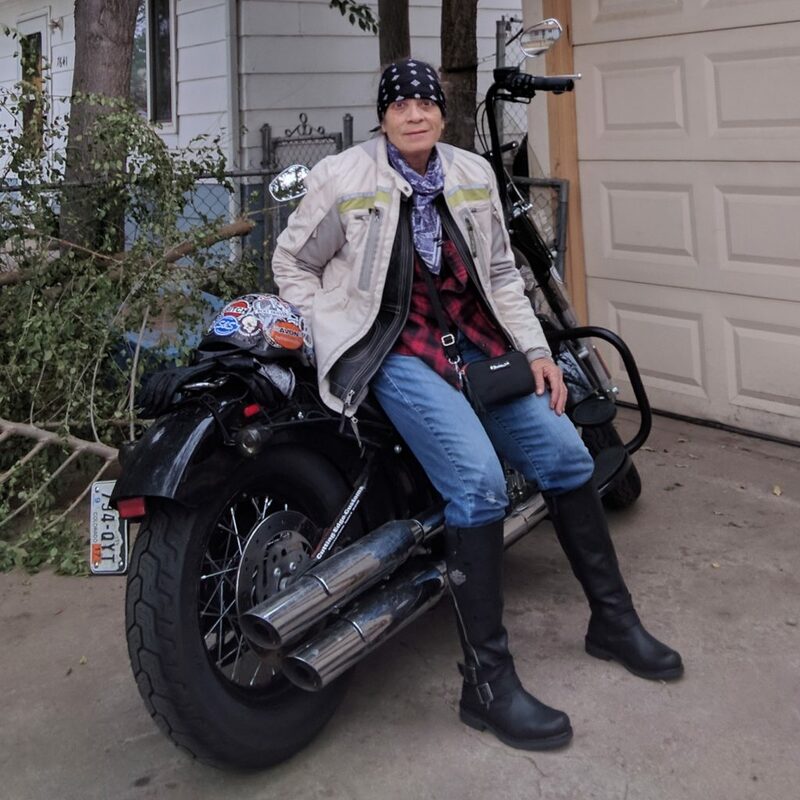 Winning the Garage-Girls Ultimate Biker Makeover sent my design mode into overdrive as I sorted through the sponsor gift offerings that would support my desire to ride and endure the 10K miles of Hoka Hey for the charities I decide to ride for. A way to pay it forward! 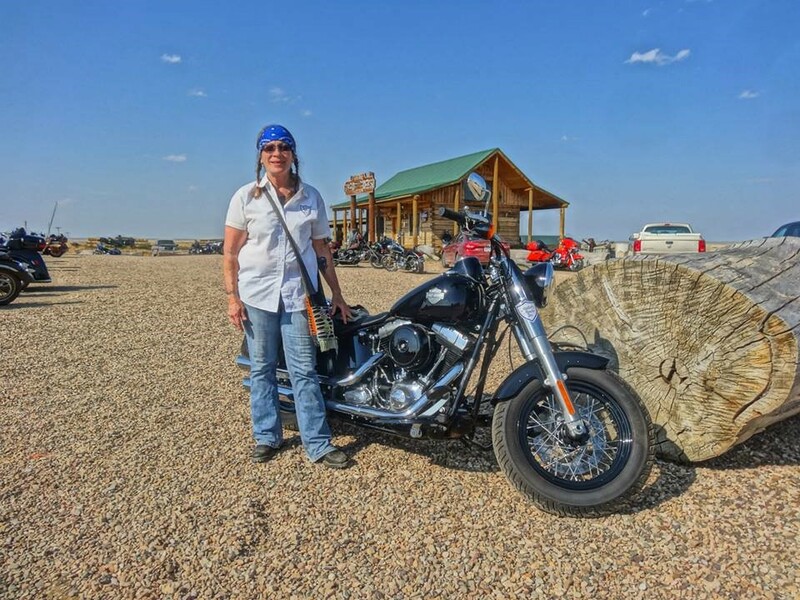 Thank you Patricia for taking the time to chat with us, we are certainly excited to see all the places you ride to in 2018 and will be following to see how the bike has come together with all your new gear! Merry Christmas and Happy New Year from all of us here at Garage-Girls! The 1st Annual “Sammy’s Ride” held on September 23rd was a great success. 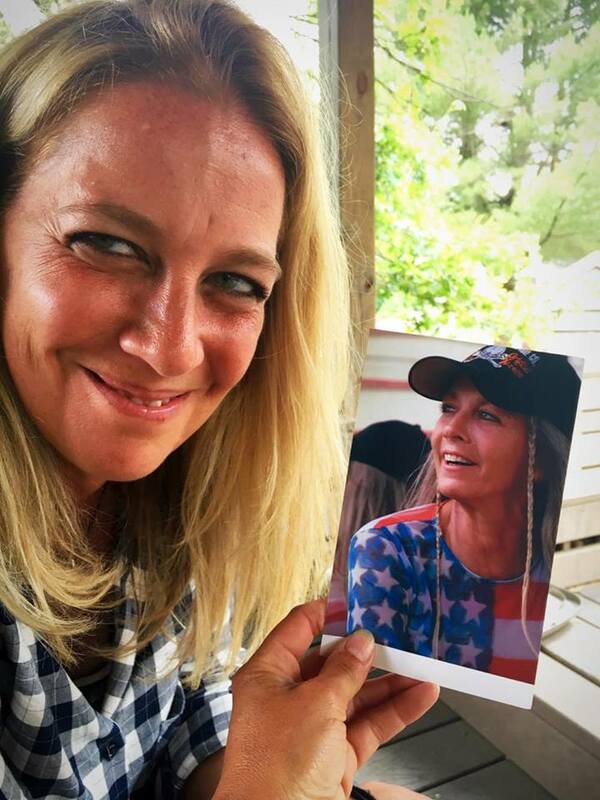 Amy Kosmin organized the run in memory of her Mother, the legendary Samantha Morgan. With 100+ bikes and all proceeds donated to “Sweet Paws” animal shelter. Amy was able to raise $4000+ to animals in need. This ride is dedicated to the memory of Samantha “Morgan” Storm, and she was my very best friend. Her life story is one of unimaginable feats. 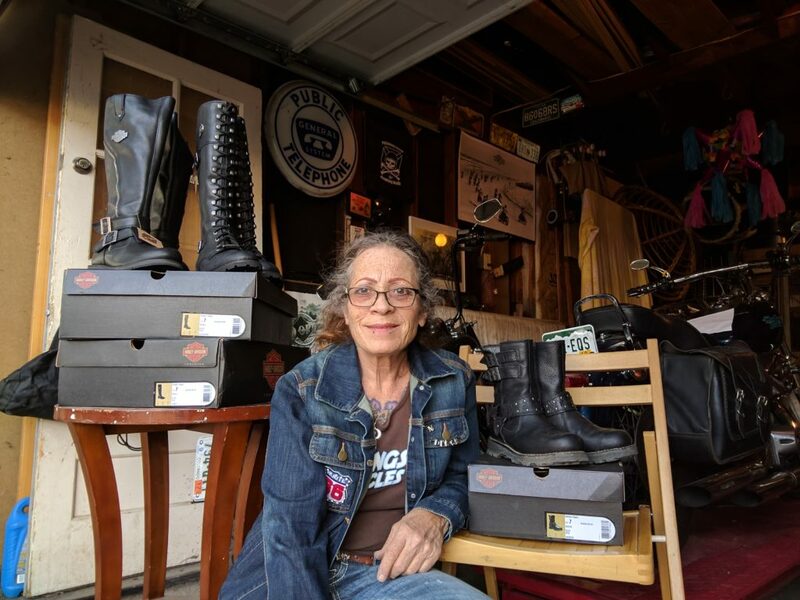 Leaving a foster parent home at age 14 to find a better life, she found her calling with Sonny Pelequin’s Wall of Death, Motor-Drome. After much persistence on Sam’s part, Sonny took the homeless kid in and gave her a place to call home and a family to call her own. Samantha had found her calling in life, something she was passionate about till her last days. It’s not very often you find a friend that shares so many of the same passions as you, Sam and I were both passionate about motorcycling and animals. Something we both loved to talk about, being able to one day have an all-girl Motor-Drome and donate the money to animal shelters, and of course foster and adopt as many as we could. 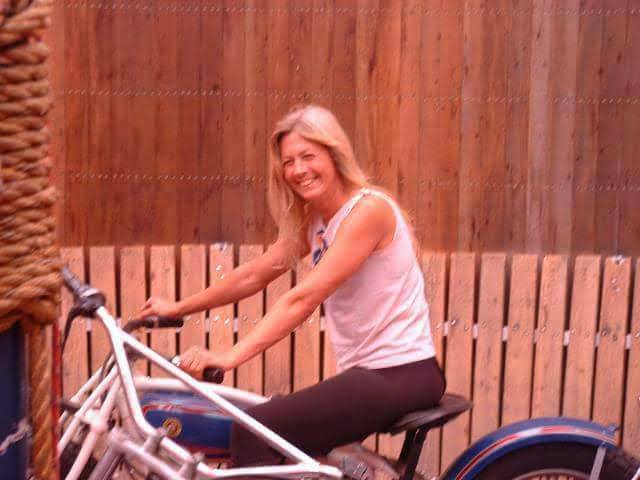 Sam’s other best friend Dianne Hancock, along with Gail Donmoyer (Samantha was a big influence on Gail as she now rides in her own families drome; The California Hell Riders Wall, Samantha rode in this drome for a number of years) took some time to tell us all about the first ever “Sammy’s Ride”. Here is an insight of the makings of such a successful and meaningful run with a positive purpose. Samantha Morgan was a strong woman warrior. She not only rode the “Wall of Death”, she lived it, she breathed it. It was essential to her being. To Samantha, the Wall was Life. Sharing Sammy’s presence was like running full speed into a wall. Her voice, her eyes, her mannerism, her passion… she was hypnotizing. Her love for the Wall was contagious, so much so, that it transcended her time on this Earth. Now meet Amy. Amy never knew her birth mother. Amy was adopted and raised by amazing parents. She never lacked love nor did she know how much she had resembled her birth mother until the day she finally went searching for her and like everyone else…. BOOM… time stood still. As Amy dove into a life of her mother’s, she discovered what everyone else that ever met Samantha also felt. Though she would never get to meet her birth mother face to face, Amy’s findings told the story of a remarkable woman. 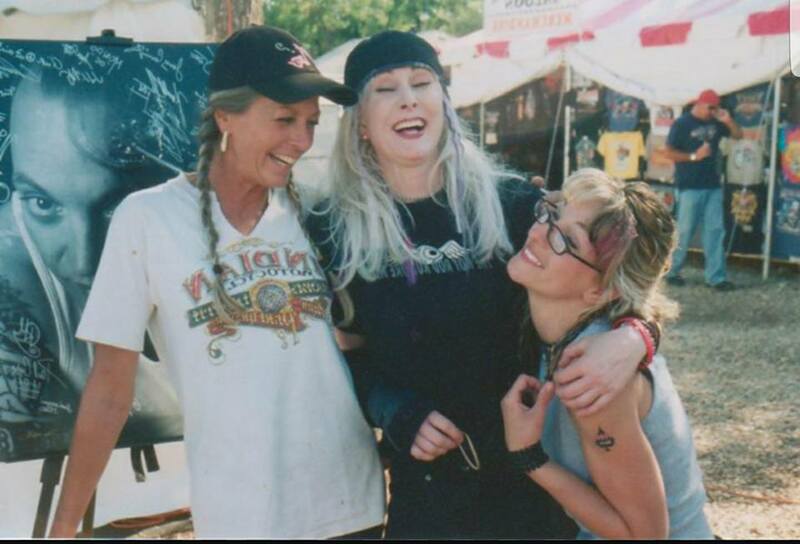 A woman who wanted to build a Drome of her own with proceeds being donated to animal shelters, unable to do so because her time here got cut short, Amy discovered a woman who’s spirit will never die because it is too strong to ever be forgotten. In honor of her mother, Amy picked up the reigns and accomplished a goal that Samantha sought out and always dreamt of. 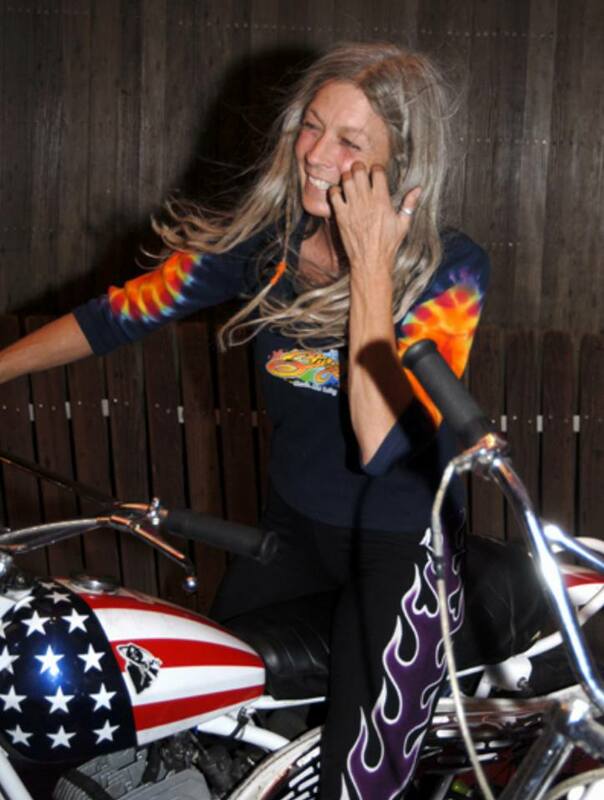 Amy organized “Sammy’s Ride”, a 1st Annual Motorcycle Run with great success. Amy has her mothers eyes. She has her mothers heart and she will continue to keep her mother’s memory alive. 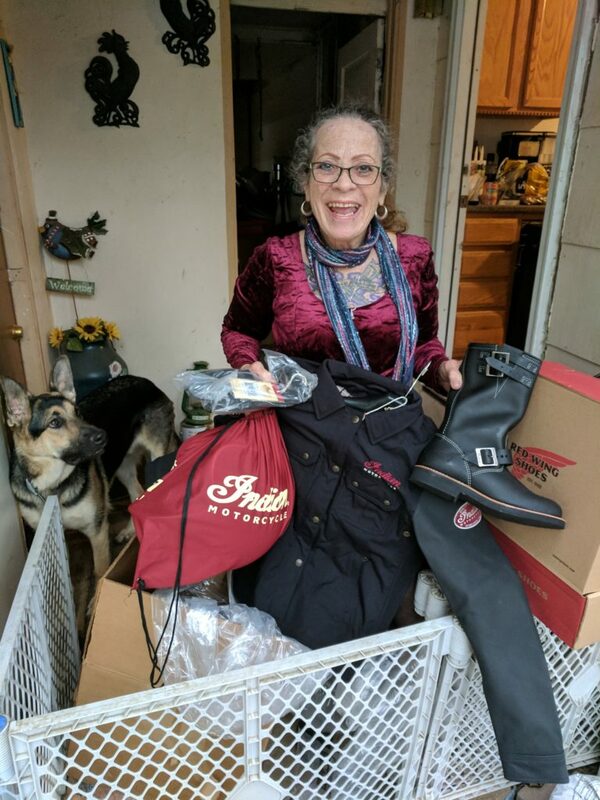 Patricia L. Thurston aka “Ditch”, Congratulations you are this years winner! Every year we say this, and trust me, every year we mean it. It’s very hard to pick ONE winner, we had 61 entries this year, and the team had to narrow that down to only 4. From there we had a select panel cast a vote. 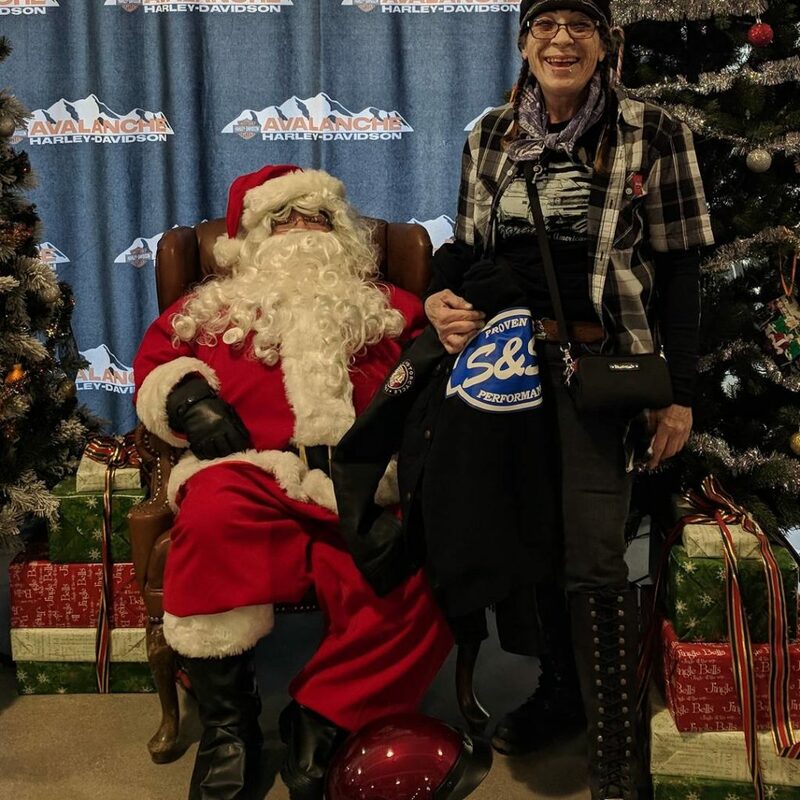 Patricia took the win this year and will be getting “hooked up” with tons of gear for not only her motorcycle, but also with gear for herself! We are pretty sure you will understand why she was chosen. Patricia has, like many of us, been faced with obstacle after obstacle in life, and somehow manages to carry on. We are really happy to shine some light on her with the help of our awesome sponsors and send some goodness her way. If you take a minute to read her story we are pretty sure you will be able to relate. We need to send a GIANT thank you to all who submitted an entry, you all are deserving and we sure hope we get to meet some of you out on the road at an event. Thank you of course to our sponsors who make this all possible. It is a great feeling knowing we have partners in our industry who feel just as passionate about helping a fellow rider out as we do. 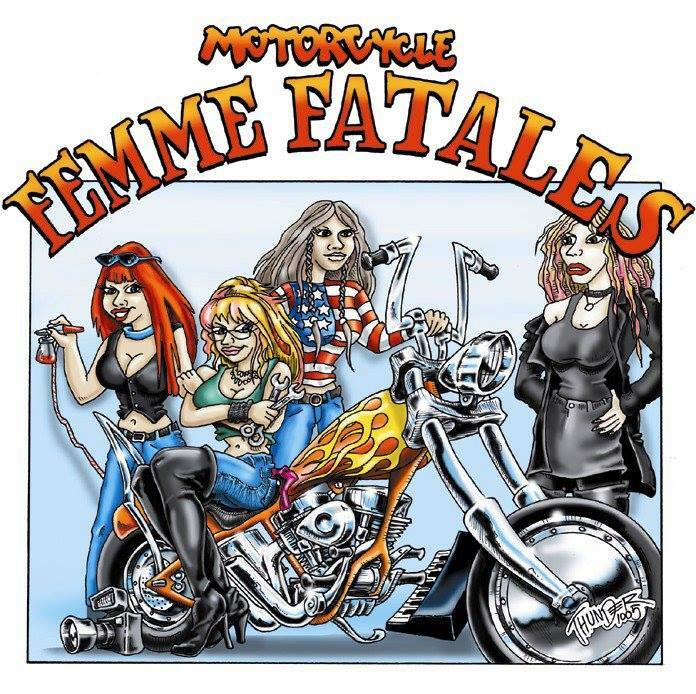 Next year will be the 10th anniversary of the Garage-Girls Ultimate Biker Makeover and we are looking forward to planning a great one full of surprises! “Why me? I was working on my 1998 Dyna Superglide and realized it was in dire need of a little care to ride again, I wondered where I was going to find the few dollars I needed just to get a pair of “boots” (tires) on “Baby”, just to ride her. I would like to note, I perform my own bike mechanical work, to include removal of tires; for the change. Oops! I should provide some history, I’ve been struggling with health issues and really wanted to try to go for my masters degree. I was at a government job and the position didn’t work for me as a person, I left in July 2016 the nice IT analyst position, keeping my integrity intact. I Felt since I had already been looking for work, something would crop up soon…it hasn’t! Not many take lightly leaving a position of that nature, but life’s too short for taking oneself into the gutter and my faith tells me, God has a plan somewhere down the road. Just prior to leaving my job, my family had been struggling, my son, an over the road truck driver, was nearly killed in a freak accident that quite literally peeled the semi and trailer apart, leaving him dangling for his life, buckled behind the drivers’ front wheel, at about 55mph while taking out a toll gate…seems there were issues with the brake lines. The last year has been none to kind to my son’s family, as he and his fiancé and five grandkids of mine struggle with Chris’ near crippling back and short-term memory head injury issues from the semi-wreck. I’ve been supportive, both financially and of course, as a mother, lots of love. During this time, I drained years of small savings, just enough to live; as I really hadn’t tucked much away, I used the money to continue my masters, pay my monthly bills and help my family as much as I could. Now, several thousands gone and still no work. As I take moments riding in the wind, I feel my faith knowing, it’s in the plan! Oh, it gets better, as our family struggled along, in late October 2016, life changed again for us as a family, more than it should. I was in PA/WV for the “Aidan’s Ride”, when I get a call very early in morning from Colorado, my son was a piece of the news, a hit-and-run motorcycle accident and he nearly lost his leg! They caught the person, with limits of liability, so the medical expenses were at least covered, however, he now has a rod holding his foot on, and now has to see heart and neuro doctors’ due to the damage to his body. Thank you for sharing your story with us Patricia! For instance, I learned a muffler and an exhaust are two different things when I installed the Twin Slash Slip-on from Vance & Hines. Who would have thought a muffler silences noise and is not the exhaust system itself! One of the prizes I was most excited to win was a new pair of boots from H-D Footwear and Cobra Tires from Avon Tyres. Lol, I remember commenting, “I’m excited to win a new pair of heels and my motorcycle is excited for a new pair of wheels”. This is when I learned tires and wheels are also two different things! Hey, I’m learning! 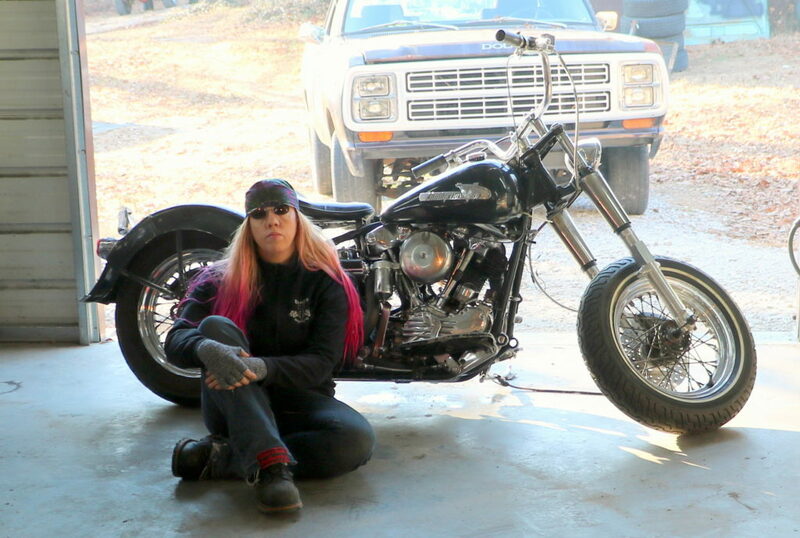 The Ultimate Biker Makeover Contest motivated me to learn self-maintenance on my Indian motorcycle. There was just one thing I needed; a set of tools! 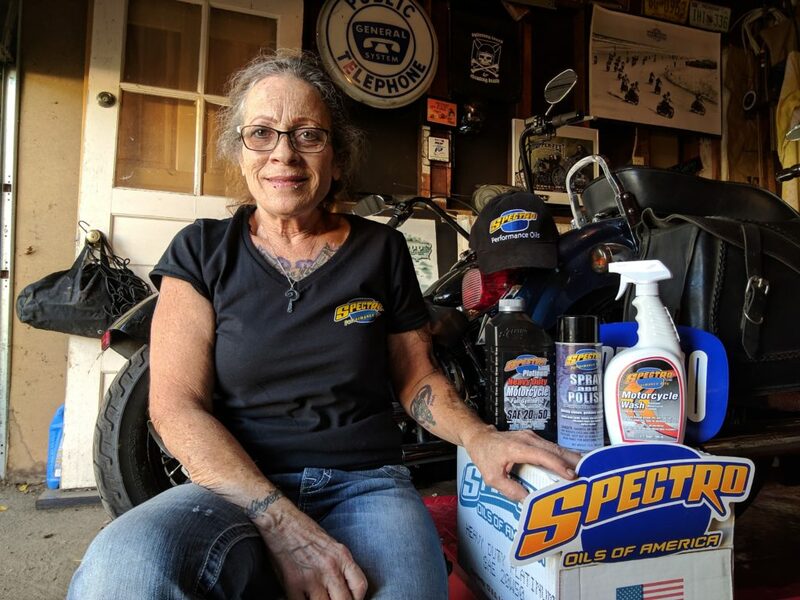 I bought my first set of tools and used it to change my oil with the Spectro Oil I just won. Yes…. I did manage to strip the drain plug, but I learned how to use a torque wrench! 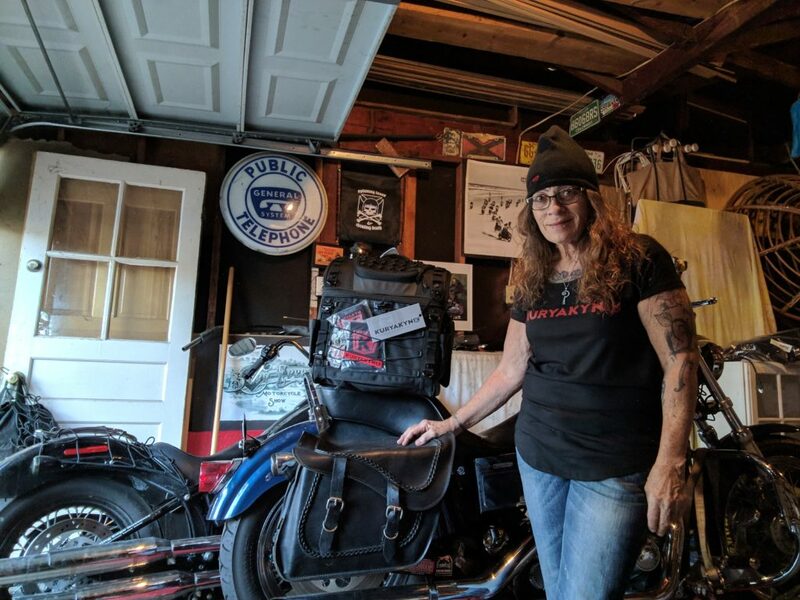 I learned how to self-install Kuryakyn accessories, a sporty Mustang Seat, and Klock Werks adjustable handle bars with, the editor of American Iron Garage. I give Tyler credit for being so patient to teach me the self-installs with a million questions from me of how these fascinating tools worked. One of the coolest parts of wining the contest was the friendships I made along the way. Dean Young II and Grant Hillegass taught me to self-install the Stealth Two air filter in my Indian Scout motorcycle and in doing so took me under their wing to teach me Motorcycle Education 101. 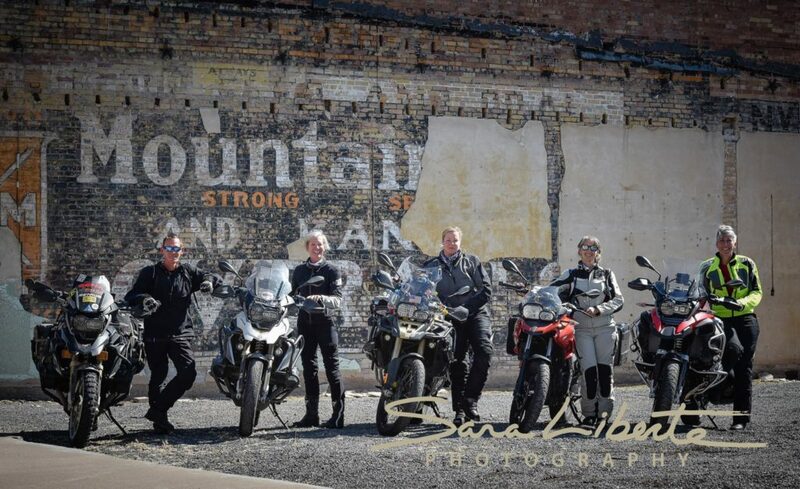 The team from S&S Cycle invited me to their facility where Grant Hillegass gave me a personal tour of their museum. This is the day I learned so much about motorcycle performance. For instance, a Dyna (Harley Dyna) and dyno (short for dynamometer) are two totally different things. However, S&S cycle makes them both perform well. Now don’t get me wrong, I’ve made my mistakes while learning motorcycle maintenance; but in comparison, who hasn’t ‘fallen off their bike’ as they learn to ride. 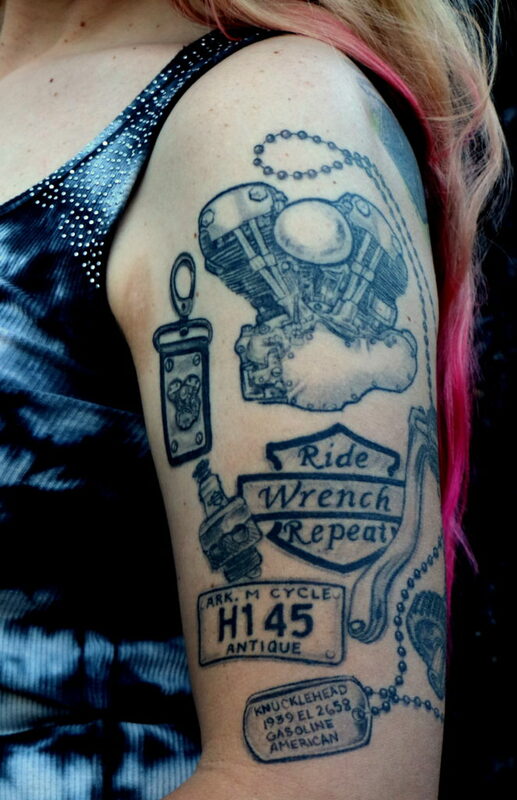 It is the courage to get back up, get back on, and learned to ride thanks to Sara Liberte. 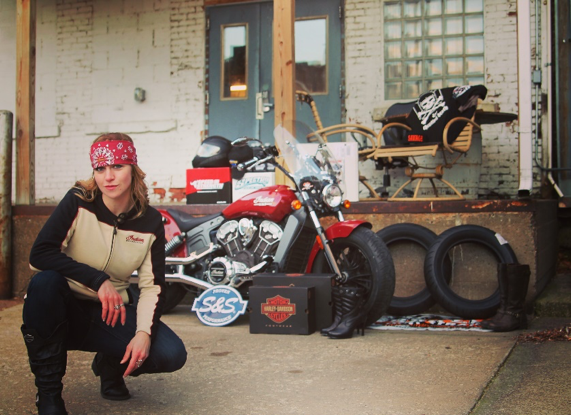 I’m not sure how I could ever repay Sara Liberte from Garage Girls for what she did to change my life by establishing the Ultimate Biker Makeover Contest. However, in paying it forward it has inspired me to create a platform for motivating someone down the road. I am in the process of creating a website www.ridingwithleah.com for people to follow my journey of overcoming life adversities through sharing my travels around the United States. My goal is to someday use the website blogs to write a book, thank you Sara Liberte… You Go Girl! Thank you to all who submitted entries for the #ultimatebikermakeover We have 61 entries to read through, and like every year, wish we could help everyone “Score” the gear! The best part of our “Garage Community” is the ability to help one another. We encourage you all to help others out any opportunity you have. What may seem simple to you, can make a huge difference to someone! Thank you to Allstate Motorcycle for helping us to #keepridersriding We also want to say a sincere thanks to the sponsors that help us organize this event, Harley-Davidson Footwear, Indian Motorcycle, Spectro Oils, Design Engineering, Inc., S&S Cycle, Inc., Kuryakyn, Klock Werks, MotoChic Gear, Mustang Seats, Memphis Shades. We will announce the winner here on August 10th! Stay Tuned!